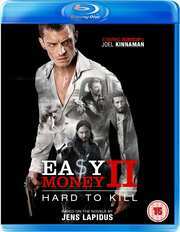 Fans of Swedish cinema should be a little excited to hear that Icon Film Distribution have Easy Money II: Hard to Kill coming to DVD and Blu-ray on 7th April. Directed by Babakna Jafi and based on the novel by Jens Lapidus, this action thriller stars Joel Kinnaman, Matias Varela, Dragomir Mrsic and Fares Fares. Alas not many other details we can give you on this, other than the recommended retail prices of £12.99 for the standard definition release, and £17.99 for the hi-def version. JW, the promising business student who became an organized coke smuggler, is serving hard time in prison and struggling to get back on an honest path. There are glimmers of hope in his life, some venture capitalists are interested in a new piece of trading software he's developed, and while behind bars he's made peace with an old enemy. This all proves to be an illusion. On leave from prison, and back in contact with his former gang, JW learns that once you've walked in the shoes of a criminal there just may be no going back.